Our Lavender Gin and Tonic Punch is light and refreshing! It’s naturally flavored and the beautiful purple color is from butterfly pea tea. Absolutely perfect party punch for spring and summer. I planted about 15 lavender plants in my yard and they are all blooming and look gorgeous! 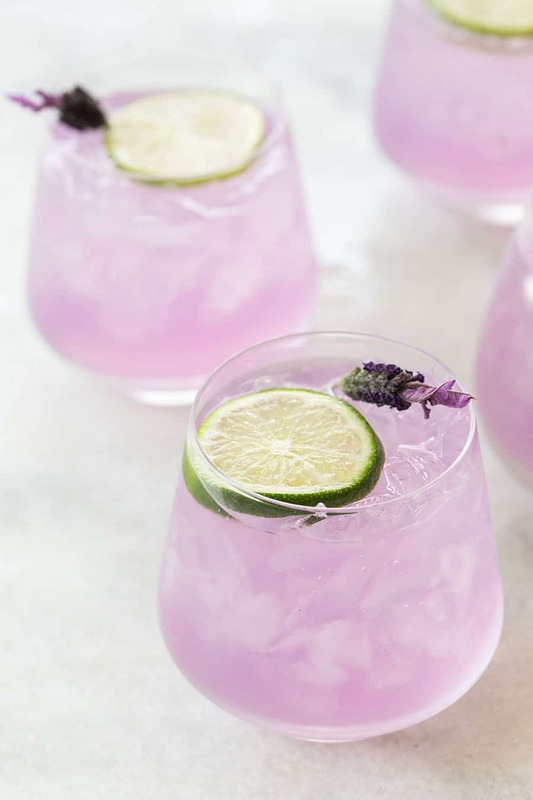 Lavender is one of my favorite scents and flavors so I like to incorporate it in foods and cocktails as much as I can. I thought it would be nice to add a hint of lavender to one of my favorite cocktails… a gin and tonic. Not only does this cocktail have the lavender flavor and scent, it also has the most beautiful purple color! It’s a crowd pleaser for sure! Gin and tonics are incredibly easy to make and only use gin, tonic water and lime. Those are the standard gin and tonic ingredients. You can add fruit and berries and more to give gin and tonics a twist. To make a lavender gin and tonic we infused the gin with dried lavender. We also infused the lime juice with butterfly pea syrup to give to cocktail a beautiful purple color! How do you infuse spirits? Infusing spirits is a great way to get a natural flavor that you want in alcohol. Herbs, fruit, berries and even candy all work great for insuring spirits! For this we used 2 tablespoons lavender to 1 1/12 cups gin. The longer the lavender sits in the gin, the stronger the taste and smell. For this, you can do anywhere from 5-24 hours. After 5 ours you will be able to smell and taste the lavender. Once it’s finished, pour it through a mesh strainer, letting the gin fall into a glass and catching the dried lavender to through away. Why does butterfly pea tea change color? Since lavender isn’t strong enough to produce the purple shade I wanted for our cocktail, we infused the lime juice with Butterly Pea Tea! Butterfly pea tea comes from blue butterfly pea flowers. It changes colors based on the pH of whatever it’s mixed with. When it’s mixed with an acid like citrus it will turn purple. When it’s by itself, steeped in hot water it’s blue. We made natural blue ice cubes using it as well. Here is some more info about Butterfly pea flowers. For this recipe, we combined 2 tablespoons dried butterfly pea flowers with 4 ounces lime juice and let it infuse for about an hour. It turned a deep purple color that was perfect when mixed with the other ingredients. 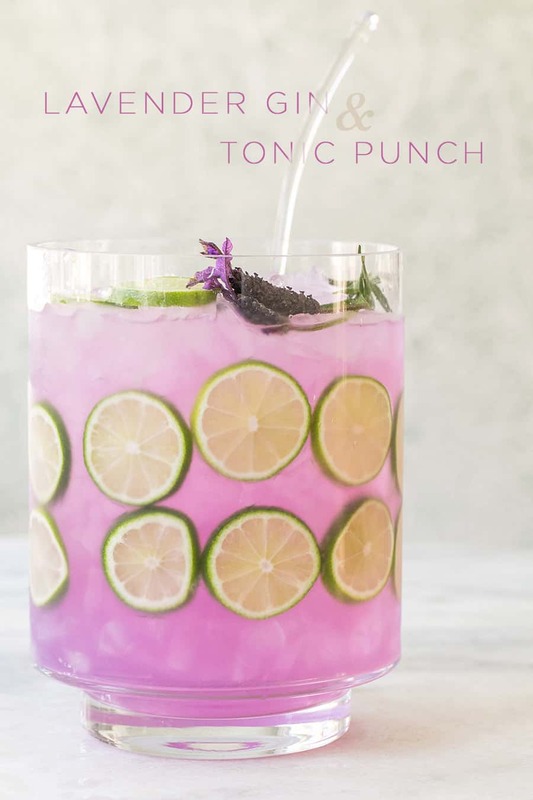 Once you’ve infused the gin and made the purple lime juice, you can add the ingredients into a punch bowl with 32 ounces tonic water crushed ice right before serving. This will serve about 6-8 people. If you make this recipe, please let us know by leaving and comment and review! You can also share by tagging our social channels @sugarandcharm. We love seeing what you all make! Infuse the lavender and the gin in a glass and set aside for 5-24 hours. Then strain over a mesh strainer, saving the gin and discarding the lavender. Squeeze the lime juice and place in a bowl with butterfly pea flowers. Let it sit for an hour to infuse the color. Should be a deep purple color. Strain over a mesh strainer, saving the juice and discarding the tea. Add the infused gin, infused lime juice and tonic water to a punch bowl. Add in the ice and sliced lime for garnish. Enjoy! Remember the gin needs to be infused for at least 5 hours. The longer it stays in the gin the stronger the scent and taste. You can decide how strong you want it. The butterfly pea tea is great to keep on hand. You can buy it on Amazon and it will turn food and drinks blue and purple naturally. You only need a little! Add the ice about 10 minutes before guests arrive so it's not too watered down. Remember to add more spirit, lime juice or tonic water for your taste! Everyone's taste is different, so you can alter to what you like. Seriously loving this! It’s so pretty and is perfect for a spring event or wedding! It sounds delicious as well! The color is so pretty!! I bet this would be a hit anywhere you make it! This is something I definitely need to try.